People have been drawn to Massachusetts for a long time — after all, it was where the Pilgrims made their fateful colony at Plymouth all the way back in 1620. And it’s not surprising that the state is so magnetic. From its stunning seashores to rolling, tree-covered hills in the west, The Bay State has a whole lot to offer… especially if you’re an adventurous type. You can take a relaxing and perspective-increasing stroll along the cliffs of Martha’s Vineyard or explore the string of lighthouses that decorate the state’s coast. Or you can relax under the shade of the state’s stunning western forests, hiking, biking, and taking in the welcome dose of fresh air. Of course, Massachusetts is also home to some of the finest educational institutions in America, including the Massachusetts Institute of Technology, Harvard University, Amherst College, Brandeis University, and more. That means that the state’s a cultural mecca as well as a rural outdoor wonderland — a heady combination, to be sure. And we can’t forget about the incredible historical tourism available in Boston, which can be a vital educational experience for children. Sitting in history class memorizing dates is one thing… but once they actually see the harbor where the famed Tea Party occurred or read some of the dates on the old headstones in the city’s cemeteries, they’ll understand that history is really about human stories. Of course, you’ll have to do some driving to take it all in, which makes an RV a perfect means for Massachusetts travel. You can find many Massachusetts RV rentals both through the peer-to-peer RV rental marketplace and larger, corporate RV rental dealerships… but after a while, you might just be tempted to find a rig of your very own. If you’ve never been to an RV show or travel trailer expo, you might be surprised at what a great opportunity it is to shop for your first (or next!) recreational vehicle. Dozens of dealers all gather under the same roof to offer you an unparalleled opportunity to explore a range of types, shapes, sizes, and models, so you’ll get as much information as you need before you sign any papers. But what are the best RV and motorhome shows in Massachusetts? It might be a major urban center, but it turns out that one of the finest camper and RV shows in the country is smack-dab in the heart of Boston! So if you’ve been looking for an excuse to hit Bean Town, you might just have the perfect reason to steal away to the city this January. Sponsored by New England RV Dealers Association, the Boston RV and Camping Expo is one of the largest RV shows in the northeast, featuring well over a dozen Massachusetts RV dealers and even more camping equipment vendors, outdoor outfitters, and experts. These dealers will offer you the opportunity to scope out the latest models of motorhomes, fifth wheel trailers, conventional travel trailers, pop-up or folding campers, and more from all the hottest manufacturers. Other vendors will be standing by with camping supplies, accessories, and information about area campgrounds. And don’t forget that once you’re done browsing the motorhome show, you’re deep in the heart of one of the most exciting cities in the world! The convention center is located in Boston’s famous Seaport District, which is home to a variety of museums, art galleries, restaurants, and breweries all waiting for you to stop in and explore. Children 12 and under: FREE with adult admission! Please note: The box office will close one hour prior to the end of the show each day. Tickets can be purchased either online (with no associated service fee) or at the door and will never sell out. You may pay with cash or major credit card. Furthermore, please remember that $1.00 of every ticket sold is given to various Boston charities. 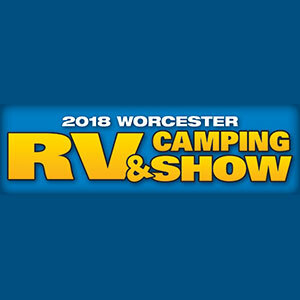 Along with offering special show prices on the latest models of all sorts of RVs, the Worcester RV and Camping Show has one very exciting benefit going for it — free tickets! According to the website, free passes to the show will be available on January 8, so check back then to make sure you can get your cost-free entry. Worcester is centrally located and within a short drive of many exciting and picturesque camping sites, which makes it perfect for a family vacation — or a romantic getaway. After all, the show does take place right after Valentine’s Day… what’s more romantic than planning future camping trips together? And, as the website helpfully reminds us, “It may be winter, but it’s warm inside!” So you don’t have to worry about braving the snow while you scope out your next rig. Worcester itself is also a worthy destination; the county is the second largest in New England with a population of almost 1,000,000 people. That means you’ll have ample opportunity to talk, ask questions, and network with RV dealers, outdoor equipment purveyors, and, of course, campers from across New England — not just Massachusetts! You’ll also be able to explore the city of Worcester, which boasts a range of art and history museums as well as world-class dining options. Friday, February 23: 4 p.m. – 8 p.m. Thought you wouldn’t be able to attend a killer RV camper show without leaving western Massachusetts? Think again. The Springfield RV, Camping and Outdoor Show isn’t just one of the best in the area — it’s one of the best in the country! In fact, this year will be its 56th running… so you know they’re doing something (or a lot of things) right. Every year, more than two dozen RV dealers descend on the city of Springfield to help visitors find the rig of their dreams. Whether you’re shopping for Class A, B, or C motorhomes or looking for a conventional, fifth wheel, or pop-up travel trailer, you’ll find an ample selection of models to choose from on the showroom floor. As if that weren’t enough, the convention hall is also populated with representatives from almost 100 campgrounds both in Massachusetts and beyond to greater New England, so you’re sure to learn about some new destinations and even put one or two on your travel bucket list. Better yet, many campground owners offer free giveaway weekends to lucky campers… so don’t miss your chance at a cost-free getaway! Best of all, you don’t have to worry about the harsh winter weather, even though the show takes place in late February. The Eastern States Exposition Grounds in West Springfield, Massachusetts includes a series of heated buildings, so you’ll be nice and toasty while you do your shopping at this travel trailer show. After you’re done browsing the plethora of campers, take advantage of the show’s Springfield location by heading out for a relaxing trip in the Tunxis or October Mountain State Forests, both just a short drive away. Or enjoy everything Springfield itself has to offer, like the Doctor Seuss Memorial or the Springfield Armory. Hartford, Connecticut is also just a short distance away, and filled with fun discoveries for the whole family. Friday, February 16: 4 p.m. – 9 p.m.
Monday, February 19: 10 a.m. – 4 p.m. Discounts: When showtime gets closer, you’ll be able to print a free coupon from the website which will get you $2.00 off your standard admission fee. As you can see, Massachusetts is a fantastic place to be if you’re in the market for a new RV — or if you’re just eager to walk through a ton of different models. Hey, it never hurts to learn more about your options! RV shows are a great way to connect with the wider RVing community, learn more about possible future destinations and campgrounds, and find out about the latest and greatest in camping and outdoor adventuring equipment and technology. And where better to do all that exploration and discovery than Massachusetts, which was one of the first places our colonial American ancestors discovered so long ago? Although that’s far behind us in history, you’ll doubtless agree that this special state has a whole lot to offer to campers and travelers of all kinds — whether you’re making the journey by RV, sailing across the ocean in a ship, or even just meandering along its trails on foot. Enjoy your trip — and your time at the RV shows!